this is my third film. "brooklyn bridge" made from shots i took while on a walk with my father. i think this my favorite...so far. the music is just lovely. this is "starry night." my first film!!! sequential shots of the manhattan skyline at night. shot from my rooftop. pay attention and look close! you dont want to miss anything. this one is special. This is "fireworks" created aug of 2008. my second film. made from 335 sequential digital shots of new york citys 4th of july fireworks show. music is beethovens 7th symphony. Its been awhile since last i spoke! I've been in Mexico! 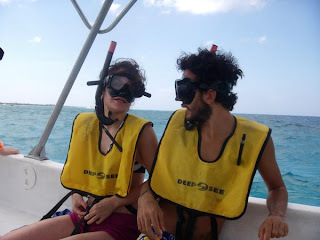 Here i am with my sister Danielle in Cozumel deep sea snorkeling! It was incredible. Unfortunately the cruise we are on is the cruise to HELL!! Its been a rough three days so far. The ship has been pretty rocky and everyone is dropping like flies. Seasickness is no fun. and neither are cruises. However, its been an unforgettable experience to say the least. One we will surely look back over the years and laugh. or not. OK, so i´ve been pretty sick the past few days and honestly haven´t even left my bed once! Except to go to the bathroom of course. Anyways, i thought i would explore the village now that i had my energy back. I took to the shore and headed east. I heard there was pretty nice swimming about 30 minutes up shore. Narrow dirt and rock paths run along the shore. The views are spectacular! And there are tons of little spots where the dirt path leads right to perfect steps made out of rocks that lead right to the water. Its incredible.The water is aqua marine up against golden rocks that lead right into green jungle! I think im going to stay here for a few days and just enjoy the swimming and the ridiculous views! The water was the perfect temp. Refreshing. I think im healed! I mean really this volcanic crater water does wonders for the soul. I wasn´t really feeling San Pedro. Its a bit touristy and i found the people to be very money hungry and the streets were polluted. Toxic smells everywhere. I had heard about San Marcos, another village on the lake, which apparently was a very spiritual place. I decided to head over. I took a small lancha ferry and when i arrived at the dock is was apparent that this place was pretty special. There were no roads, instead rocky windy paths lead you all over the village and the views from this side of the lake were amazing. Unfortunately, when i got off the boat i was feeling a bit sick. I found a hotel room and had to lay down. I think i ate some bad food in san pedro :( Luckily, this village is filled with natural clinics, yoga studios, reiki, massage and mayan saunas so i will definitely make use of this while im here and refresh myself. The owner of the hotel told me he would give me some grapefruit extract. It was either that or drink my own urine. hmmm. I chose the grapefruit extract. This is definitely a place to just kick back and relax for a bit. So i think i will be here for a few days until im feeling 100%. Also, the hotel is sooooo nice. It has a vegetarian restaurant, daily yoga and a mayan sauna. All for $4 a night. Shown above is my cabina, which is filled with antiques, mayan artifacts and probably the most comfortable bed ive slept in this entire trip. Not a bad place to be sick. Lago de Atitlan is actually a crater lake created about 60,000 yrs ago from a huge volcanic eruption. About 20 to 30,000 years later three other volcanoes formed around the crater. Surrounding the lake are about 12 mayan villages all with their own vibe and history. Its a pretty crazy place. You take small boat lanchas to get from village to village. This shot is taken from San Pedro la Laguna, one of the villages i visited.